San Francisco -- Where to stay in the City by the Bay? Lodging was the big issue (isn't it always) for my wife Linda and I on a visit to the West Coast. We wanted something different, something unusual. Did I say unusual? We can stand imperfections. Some, anyway. On previous trips we had lodgings downtown (at the budget-minded but nice Hotel Californian which has turned into the upscale Serrano). Other locations included sites out near the zoo, near Golden Gate Park and on "motel row" on Lombard Street. A search on the internet turned up a good price on a standard room at a national chain. Free parking was included so I locked it in. Since we weren't planning on renting a vehicle -- I decided to to surfing to see what kind of unusual lodging "gem" would surface. I did an Internet search on "San Francisco" and found a newsletter by Martha Bakerjian who writes about the area and also has links to a myriad of interests including lodging. I signed up for her E-mail dispatches. Articles included those about free museum days, festivals, street fairs, afternoon tea services at different locations around the business district, the farmers' market at the ferry building and walking tours, among others. A line on the web page proffered "bargain hotels and hostels." I was game -- let's see what they had to offer. Most people (myself included) who use the Internet know that what is presented on a site doesn't always measure up to the real deal. 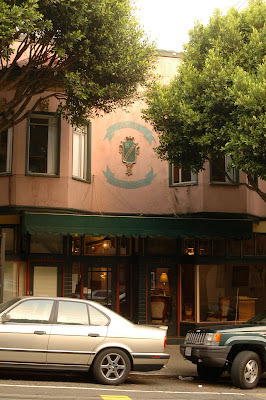 One teaser by Martha: "Where to stay in San Francisco without going broke." It sounded good. "Think you can't afford to stay near the action? There are several budget options located on the outskirts of North Beach, near the Marina and close to downtown. Here are some budget options all near great restaurants, tourist attractions, nightlife and public transportation." My wife and I were looking for an inexpensive place to lay our heads for a week. 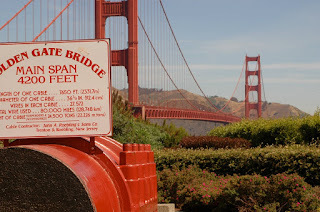 A place on the cable car line, a room with a picture window (that would open and let the cool air in) that offered a view of the Golden Gate bridge and an interesting and enjoyable nearby local non-touristy spot for breakfast. That was really asking for a lot. The description continued: "The Hyde Regency: A great location on the Cable Car line on a quiet Nob Hill street. A bargain at $75 for a studio with kitchenette (which could save you some money on food). They also have suites so if you are traveling with more than 2, its a good deal. These rooms are not always available for stays of only one night, check with hotel." There was a quick click for additional information. I'm a sucker for what looks like a good Internet deal. 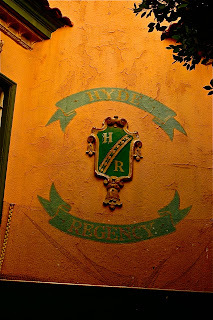 And then we read: The Hyde Regency: Atop Russian Hill in a quiet part of Hyde Street on the cable car line is a real find. The Hyde Regency is a small, affordable hotel offering studios and suites for short or long stays all with kitchenettes and private baths. It's a great place for business or vacation travelers. "The hotel is an Edwardian style building in a neighborhood full of European ambiance, offering small shops, bistros, cafes, interesting architecture and great views …"
This sounded good but rates were now $85 per night with weekly and monthly rates available. Their website was next. The three pictures looked great. One was of an extra-nice, modern looking studio apartment with a small kitchen. Another photo showed a cable car turning a corner, apparently near the hotel, and a third picture of the "Crookedest Street in the World." The song-and-dance routine continued: "The Hyde Regency allows any client an opportunity to experience San Francisco's charm first hand … located a few blocks from Lombard Street, the Crookedest Street in the World. 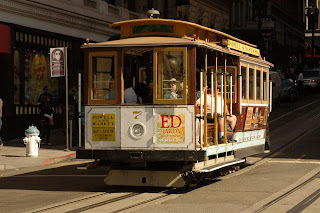 The famous Hyde Street Cable Car, just outside the front door, will magically transport you to Fisherman's Wharf, to Chinatown, Union Square, Nob Hill or the Financial District. Simply imagine commuting to work by historic cable car." I was sold! I wanted to be transported magically all over the city by cable car. 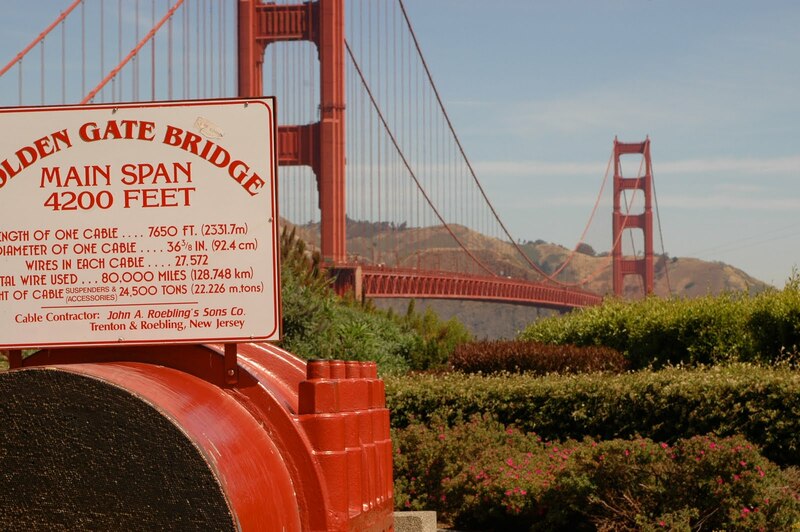 What a great deal, but they didn't say their rooms offered a view of the Golden Gate Bridge. After a few E-mail transmissions over the course of 10 days, the deal was sealed. Surprisingly, it was $500 for seven nights plus tax. I cancelled the "motel row" reservation and hoped for the best. The manager, in making a pitch for us to make a reservation, said he might be able to put us into a room with a view of the Golden Gate Bridge. Yea, right! Our journey took us from Gulfport and then through Atlanta. "The Hyde Regency," I told the shuttle driver at the San Francisco International Airport late that Friday night. "The Hyatt Regency?" he responded, referring to the more expensive downtown high-rise near the convergence of Market and California streets. "No, the Hyde Regency in the 1500 block of Hyde Street." The driver knew where Hyde Street was. And he found the 1500 block, but he couldn't find the hotel. I told him to just drop us off. It had to be somewhere near. Address in hand, the search took on a life of its own on the odd-numbered side of the street. The sign, apparently printed on a computer, said it all -- Hyde Regency. The two-inch-high letters were on a piece of 8 x 10 paper which had been taped to the picture window in front. That was the only reference I saw, although my wife said there was an appropriate sign across the front of the building. Punching in the entry code caused a buzzer to sound and the front door unlocked. Our adventure had begun. The hall was long -- 30, 40 or maybe 50 feet with two or three rooms on each side. Ours was the last one on the north side. The door had been left unlocked (keys were on the chest of drawers) as previously agreed upon. Well, it wasn't the studio pictured on the website. The main room had a queen size bed (which was comfortable), a TV with remote atop a chest of drawers, a clock radio and two night stands. The sliding doors on the small closet, which didn't sport any clothes hangers, were hard to maneuver. An iron was available. The efficiency kitchen, with a very small sink, was just big enough for one person to turn around in. A variety of unmatched plates, cups, bowls, glasses, pots and pans and eating utensils were in the cabinets and drawers that surrounded the sink. A toaster over (which we never used) sat forlornly on the countertop under which was a small dorm-room size refrigerator,. No stove, no microwave. Very rustic. The bathroom, which was an adventure to enter because only one side of the louvered door swung, wasn't much bigger but did have all the essentials. A small, round apartment-size table (with one leaf lowered), flanked by two chairs, hugged the west wall that included a huge sliding picture window that indicated a lack of a regular cleaning. And there in the distance, far, far away, across roof tops through tree branches and over gardens below, was the Golden Gate Bridge, although only a portion of the southern half could be seen. During the course of the week we secured a microwave from management (all we did with it was pop popcorn). On a stroll down the street I went into a local cleaners and offered to purchase some clothes hangers. The clerk went into the back room and came out with more than 20 which she just gave me. At a local hardware store we bought an electric pot (billed as heating water faster than a microwave) for tea and coffee. We managed to have fresh towels delivered almost when needed (they said they were trying to find a new housekeeper). The Nook, across the street on the corner, was a comfortable spot for breakfast (where we ate three times) and was open early and late and offered wireless internet. True to the hotel's website information, the Hyde Street cable car route passed right outside the front door. We caught it coming and going. The city's bus service, of which we made use, also had routes nearby. The location and local amenities (including a nearby grocery store) of the area helped sooth the rough edges. For that week, our Hyde Street room became home. It became comfortable. A place to enjoy after a a busy day -- to rest, relax and make plans for the next day. All too quickly the week was over, the days having run together through a variety of activities that got up up early and kept us out late. I placed the keys on the table by the window and took one last look at the Golden Gate Bridge through the early morning fog. We slowly closed the door and heard the clicking sound of the lock that told us it was over. The room wasn't what we had expected. But the experience turned out to be much more. As the Eagles so succinctly sang in "Hotel California," "You can check out anytime you like, but you can never leave."